The American with Disabilities Act (ADA) of 1990 provided guidelines to prevent discrimination against people with mental or physical disabilities. Signed into law by President George H.W. Bush, the law extended protections of the 1964 Civil Rights Act to the handicapped. The scope of the law is broad, covering everything from being hired or fired and to the number and width of parking spaces in public parking areas. The United States Congress passed bills through the 1970s and 1980s which broke down barriers for individuals with disabilities. A 1973 law made for the first anti-discrimination protections. The Rehabilitation Act signed into law by President Gerald Ford made it illegal for federally-funded entities--schools, universities, hospitals, and government buildings, for example--to discriminate against the disabled. A series of additional acts would follow, but it was not until the ADA was passed that a comprehensive act would exist. Parking regulations are addressed in Part 36, Appendix A, Section 4.6 of the law, under the heading of Scope and Technical Requirements. The requirements spell out how the spaces should be marked, their width (96 inches) and the amount of vertical clearance (98 inches) if the spot is located in an enclosed area, as well as the number of spaces that must be allotted. One of the major parts of the law deals with "cuts" or declines in a curb or sidewalk which facilitate easy wheelchair access. The law poses this in three separate areas, requiring no steps, prohibiting steep inclines and requiring stable and slip-resistant access points. The ADA addresses the location of the spots, stating that the spaces must be located near the building and on a flat surface. The act spells out the slope requirements of the lot, legislating that for every 50 feet of surface, the lot can decline only one foot. This is to prevent runaway wheelchairs and difficult climbs for those who have trouble walking. The law bases the minimum number of spaces on the overall size of the parking lot. All parking lots are required to have at least one van accessible parking space. If the parking lot can hold between 26 to 50 cars, the lot must have two spaces--one car and one van. The formula adds an additional standard space at 76+, 101+, 151+, 201+ and 301+. At 401 spaces, the lot is required to have seven car and two van spaces. If the lot has more than 501 spaces, ADA regulations state that 2 percent of the lot must be handicapped accessible. Parking lots with a capacity of 1,001 or more cars are required to have 20 cars and add one additional spot for every additional 100 spaces. 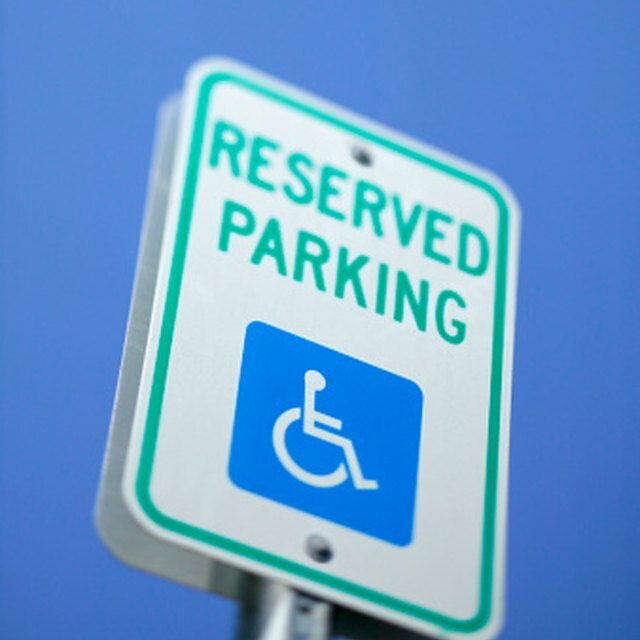 The law states that standard car handicapped parking spots must be at least 96 inches wide and have access to a loading area that is 5 foot wide. Van accessible spots, which every lot is required to have, must have an 8 foot loading area, be marked with a "Van Accessible" sign and have 98 inches of vertical clearance. Two spaces can share a loading zone as long as it is an 8 foot, van accessible space.